Samsung and Apple are frequently at each others throats over patents, but great minds apparently think alike when it comes to potential profits from third-party accessory makers. Samsung is reportedly exploring the use of ID chips for future devices as a method of warding off an ever increasing number of faulty third-party accessories. Like Apple, Samsung has seen bad publicity over poorly made accessories such as chargers and batteries from unlicensed vendors, which occasionally malfunction when used with the Korean manufacturer's devices. 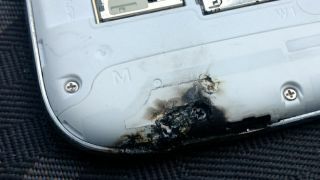 In the most extreme example, such accessories can cause a device to burn or explode, which certainly isn't in the best interest of Samsung or its customers. According to Korean news agency ETNews (via Google Translate), Samsung is apparently considering the use of "a dedicated ID chip" for future devices, which would simply reject accessories that aren't deemed kosher for use with smartphone or tablet. While such a tactic may seem extreme, Samsung may simply be following in the footsteps of rival Apple, which incorporated similar security measures into the Lightning port used with all of the company's current iPhone and iPad products. Thanks to the increasing popularity of mobile devices, third-party accessories are a booming business with the potential for huge profit margins - especially when knockoff makers can circumvent paying royalties to company actually making the devices. Of course, Samsung is also likely eyeing ways to keep such profits for itself by limiting the sale of accessories to licensed vendors, and such ID chips could be their way of doing just that. Check out our full review of the LG Optimus L9 smartphone!